Susan Neufeld, Vice President of Resident Programs and Services for BRIDGE Housing Corporation (BRIDGE), describes the existing 606-unit Potrero Terrace and Annex housing projects as “an island of poverty in a sea of wealth.” Unlike many distressed public housing complexes that are surrounded by other disadvantaged neighborhoods, residents of Potrero Terrace and Annex, with a median annual income of $14,000, are surrounded by Potrero Hill neighbors making ten times that much. In addition to living on a daily basis with this glaring disparity, Potrero public housing residents also experience a range of the other causes of toxic stress associated with concentrated poverty. These can include racism, lack of job opportunities, chronic disease and disabilities, community violence, and a sense of powerlessness while navigating bureaucratic systems for needed services. Even the physical layout of the neighborhood – located on a steep hillside with limited connectivity within the site or to nearby neighborhoods, and no easy public transit access to necessary goods and services – has left residents isolated. BRIDGE is the developer for Rebuild Potrero, a comprehensive housing, community building and resident services project undertaken by HOPE SF. HOPE SF is San Francisco’s version of the discontinued federal HOPE VI public housing revitalization program. One of four HOPE SF sites in San Francisco, Rebuild Potrero involves the redevelopment of the Potrero public housing projects that are currently home to over 1,300 residents. The proposed project will involve one-for-one replacement of the existing public housing units, and an additional 1,000 units of affordable, senior, and market-rate rental and for-sale homes. Housing prices and quality of life in the nearby wealthier Potrero Hill neighborhood will help ensure the appeal of the market rate units, which in turn will help subsidize, in an era of tight public funding, the affordable and public housing as well as programming and services. Project Status: Planning process started 2008, groundbreaking on Phase 1 anticipated in 2016. The revitalization plan includes adding retail, public green space, parks, play areas and community facilities, and an on-site early childhood education center. It will reconfigure street layouts to improve walkability and integrate the neighborhood with adjacent blocks and the larger city, and is developing a transportation plan to provide much-needed public transit for access to jobs, clinics, schools, and grocery stores. Applying principles of Crime Prevention through Environmental Design will contribute to making the revitalized neighborhood safer for all residents. With a grant from the U.S. Green Building Council to pursue LEED ND certification for green building and accessible design, the project will support environmental sustainability and environmental health, and will better serve residents with disabilities. In 2008, BRIDGE was selected by the San Francisco Mayor’s Office of Housing and Community Development as the non-profit developer for this ambitious revitalization plan, which promises to replace existing public housing with new high-quality, mixed-income and mixed-use development as the basis for a great new neighborhood. Between 2008-2010, BRIDGE engaged Potrero community residents in a master planning process to ensure the project meets their needs and those of the surrounding neighborhoods. The Master Plan has secured its environmental entitlements from the city and is awaiting the needed land use entitlements. The first phase of construction, a 60-unit affordable housing development, will break ground in 2016. The whole project is anticipated to take 10-15 years to build. For the current residents grappling with daily challenges, however – chronic disease and disability, joblessness, addiction, neighborhood violence, and limited prospects for young people in the neighborhood – a fifteen-year plan for neighborhood revitalization may seem irrelevant or intangible. Thus, BRIDGE began a process of what it calls “Trauma Informed Community Building” early on, in advance of construction, to begin building trust within the community. BRIDGE defines Trauma Informed Community Building (TICB) as “a process that recognizes the impacts of pervasive trauma on a community and creates a process to address the resulting challenges to traditional community building approaches.” Core principles of the model include 1) do no harm; 2) acceptance; 3) community empowerment; 4) reflective process. The goal is to decrease stress and increase community resilience and social capital. In 2010, Weinstein brought public housing resident Uzuri Pease-Greene on staff as the official Community Builder, and together they organized a series of small, “house party” style listening sessions. Eventually, they convened a facilitated, community-wide gathering for public housing residents and residents of the surrounding Potrero Hill community. Though several committees were proposed during those meetings, only two really held resident interest. 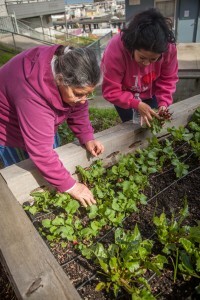 Weinstein focused on those two – the Community Garden Committee, and the Community Building Group. The Garden Committee worked together over two years to establish the Texas Street Farm, which is now a site for regular garden activities. The Community Building Group serves as an ongoing forum for all Potrero Hill residents to discuss neighborhood issues, and for BRIDGE and others to engage non-disruptively with the community by coming to the community’s existing, established meeting. Over time, BRIDGE has rolled out additional community-building activities through a deliberate process that firsts tests community interest, then fully commits to new activities that get good response. This ensures consistent programs that residents can count on. 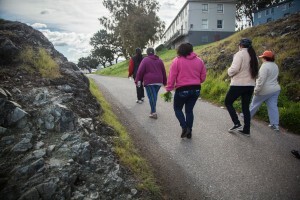 The Potrero Healthy Living Program now includes the walking club three times a week, Zumba and fitness classes, cooking workshops, meditation twice a week, and a sober living support group. 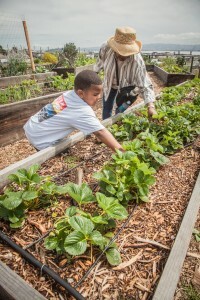 The Potrero Garden Program maintains two community gardens with youth and family activities and weekly classes. The Rebuild Potrero Community Building Group meets bi-monthly over a communal meal to highlight community building progress, celebrate activities, share updates on the Rebuild Potrero project, and provide ongoing input into Rebuild Potrero planning. Led by BRIDGE and with the support of a HUD Choice Neighborhood Planning Grant, the Community Building Group meetings have been the platform for development of the PARADISE Plan (Practical and Realistic and Desirable Ideas for Social Enrichment Plan) in 2014, a community-generated plan aimed at improving outcomes for public housing residents and improving quality of life in the neighborhood. Weinstein also partnered with psychiatrist Molly Burke and researcher Jennifer Dhillon to develop the Healthy Generations Project. Healthy Generations works with parents to support the developmental health of children aged 0-5 through workshops and ongoing peer-led parent/child activities. It also runs two daily peer-led walking school buses that walk children safely to the two neighboring elementary schools in time for a hot breakfast. Ultimately, the goal of TICB is to prepare public housing residents as well as their Potrero Hill neighbors for the changes to come. The work of TICB is complex and difficult. BRIDGE must navigate resident drug use and addiction issues, infighting and violence, all the while working to gain community trust and prevent further trauma. “There have been some scary moments,” says Weinstein. Neufeld adds, “We think of this as a two-generation strategy,” in which BRIDGE and its partners support the current generation to ameliorate the effects of toxic stress, reduce stressful triggers, and thus prevent the developmental fallout of toxic stress on the next generation. Ultimately, the goal of TICB is to prepare public housing residents as well as their Potrero Hill neighbors for the changes to come. The approach fosters an economically diverse landscape stretching across the neighborhoods, and one that guides funders, researchers, and service providers in ways to engage respectfully with the community’s processes, perspectives, and needs. BRIDGE has been recognized nationally for its work in Potrero, for example through the Citi Foundation’s Partners in Progress program, which awarded BRIDGE a grant to support its role as “community quarterback” for Potrero. Planning and community building began in 2008, the first phase of construction is anticipated to break ground in 2016, and the phased redevelopment of Potrero Terrace and Annex and their surrounds to create a safe, high-quality, mixed-income and mixed-use neighborhood will roll out over the next 10-15 years. Rebuild Potrero is a long-term, complex redevelopment project that has required a large cross-section of public and private partnerships, including direct services partners, public agencies and a range of organizations since its launch in 2008. Collaborations continue to evolve and transition as the project moves from predevelopment into the first phase of construction, and will do so throughout the project’s lifespan. This diversity of relationships is vital to addressing the complex individual, community, and systems needs of Potrero Hill Terrace and Annex, as well as the several phases of construction. While some relationships reflect a shared vision, target goals, and expected outcomes, others are cooperative and coordinated without the same level of integration. Below are a few examples of the range of relationships needed to achieve the goals of Rebuild Potrero. Direct service partners, public agencies and a range of organizations are all vital to addressing the complex individual, community, and systems needs of Potrero Hill Terrace and Annex, as well as the several phases of construction. HOPE SF is a Mayor’s initiative, and both the San Francisco Mayor’s Office of Housing and Community Development and the San Francisco Housing Authority are key collaborators in the HOPE SF program, which provides the overall vision and framework for the project. As the chosen developer for the project, BRIDGE has led both the housing development and community building efforts. Design teams from Van Meter Williams Pollack LLP, Carlile Macy, and GLS Landscape Architects, along with many others, have contributed to the Rebuild Potrero Master Plan. Other government agencies have contributed funding and resources to the effort including San Francisco’s Department of Public Health, Office of Economic and Workforce Development, Department of Planning, Municipal Transportation Agency, and County Transportation Authority, among others. The San Francisco Department of Transportation has partnered to develop a transportation plan for the area. Dr. Molly Burke, working out of the on-site family resource center, partnered to develop the Healthy Generations Project curriculum. BRIDGE also coordinates with neighborhood-based nonprofits that receive funding from the City of San Francisco, including Urban Services YMCA, The Neighborhood House, and Potrero Hill Health Center, among others. As the developer, BRIDGE will provide long-term management of the project and will manage programs and services after the construction is completed. BRIDGE is currently exploring partnerships with service providers that can provide case management and wrap around care. At this time, limited services and programming (beyond the activities that are part of BRIDGE’s community building work) are provided on site. The Mayor’s Office of Housing and Community Development serves as a primary financing mechanism by providing predevelopment funding and Community Development Block Grant (CDBG) support for the community building initiative. 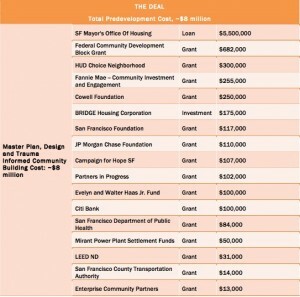 In addition, the Campaign for HOPE SF, a public-private partnership, raised private resources to help fund the community building work and provide programs and service support. BRIDGE has also secured grants from private foundations to support the ongoing community building work, including the Partners in Progress “community quarterback” award. Infrastructure costs for the project are estimated at $100 million, while the rest of the physical development costs are estimated at $500 million. Financing for the infrastructure and real estate development will include a combination of Low Income Housing Tax Credits (LIHTC), tax-exempt bonds, gap funding from the Mayor’s Office of Housing and Community Development, HUD subsidies, state affordable housing financing resources, and revenue generated from the sale of the market rate units. Once completed, cash flow from the housing development’s operating budgets will fund community building, programs, services, and service coordination with a projected annual budget of $1.2 million. Until that time, community building and service linkages will be funded through a variety of public and private sources. Through the course of the project to date there have been several significant leadership changes at HOPE SF that have impacted the direction, framework, and priorities of the project. To lead its resident engagement work, BRIDGE hired Emily Weinstein, who has a deep background in community organizing, and supported her to develop appropriate ways to work with and in the community. Her work led to the development of the TICB model. Identifying near term activities that were of interest to community residents across Potrero Hill, and committing to them consistently and regularly has helped build trust within and across residents of the public housing and surrounding wealthier neighborhoods. Creating the walking club has contributed to building trust and fostering engagement and social cohesion. The project has not yet broken ground, but there are early and promising participation rates resulting from the Trauma Informed Community Building approach, as well as promising qualitative outcomes. BRIDGE reports that nearly 1000 residents and project leaders have participated in the community design process. In addition, a formative evaluation of BRIDGE’s TICB found that from 2011 2014 community building activity participation increased by 240 percent, from 296 people in 2011 to 729 in 2014. Roughly two-thirds of participants were public housing residents in 2014, while one-third were residents of the greater Potrero Hill area. Nearly 1000 residents and project leaders have participated in the community design process. Community building activity participants report new friendships and increased social connection with others involved in such activities, including relationships among public housing residents and greater Potrero Hill residents, as well as across ages and generations. Though changes in individual health behaviors are not a focus or current goal of TICB, residents have reported improvements in physical and mental well-being, and report valuing those improvements. This, in turn, has fostered continued involvement in the activities in the process. 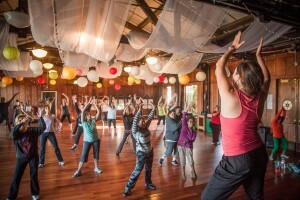 The enjoyable and non-competitive physical activities – particularly Zumba classes and the walking club – have the greatest level of participation. 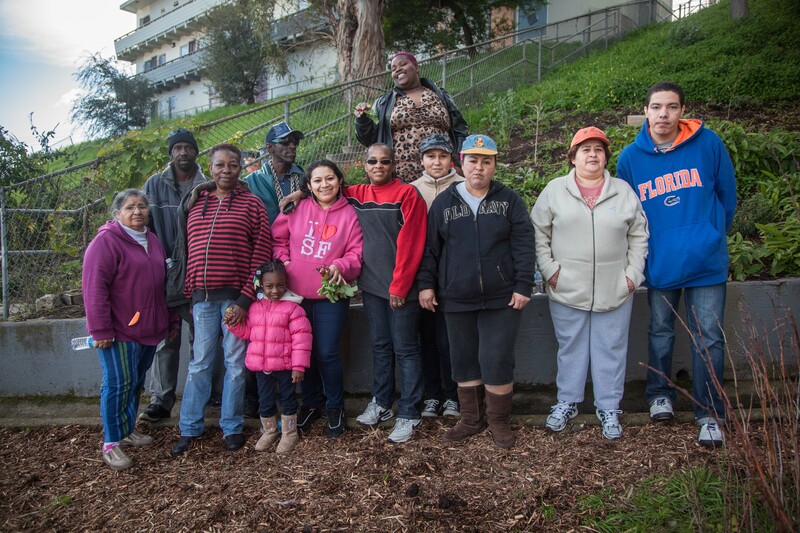 The community-building activities initiated by BRIDGE have in turn fostered community-led activities, such as the Thanksgiving dinner conceived of by Potrero Terrace and Annex residents and jointly mounted with residents of the broader Potrero Hill community. The dinner was attended by 100 people from throughout the community. Safety remains a significant concern for Potrero Terrace and Annex residents and hinders participation in community building activities. However, those residents who do participate have reported feeling a sense of safety within and during the activities. For example, the walking club sometimes takes routes that an individual might not. Accounts include stories from residents about neighbors with whom they have had conflicts “respecting the walk” and avoiding confrontations during it. In another instance, a shooting broke out while children were en route to school, as part of a resident-led walking school bus. The resident leader shepherded the children out of harms way, and the children said they felt safer because they were with the group and with an adult. Given the significant developmental and health impacts of toxic stress, increased feelings of safety are an important early outcome. Participation rates in community-building activities, new relationships within and across the Potrero Hill neighborhoods, and increased feelings of safety are all indicators that are significant in themselves and suggest a positive future for Potrero Hill residents. 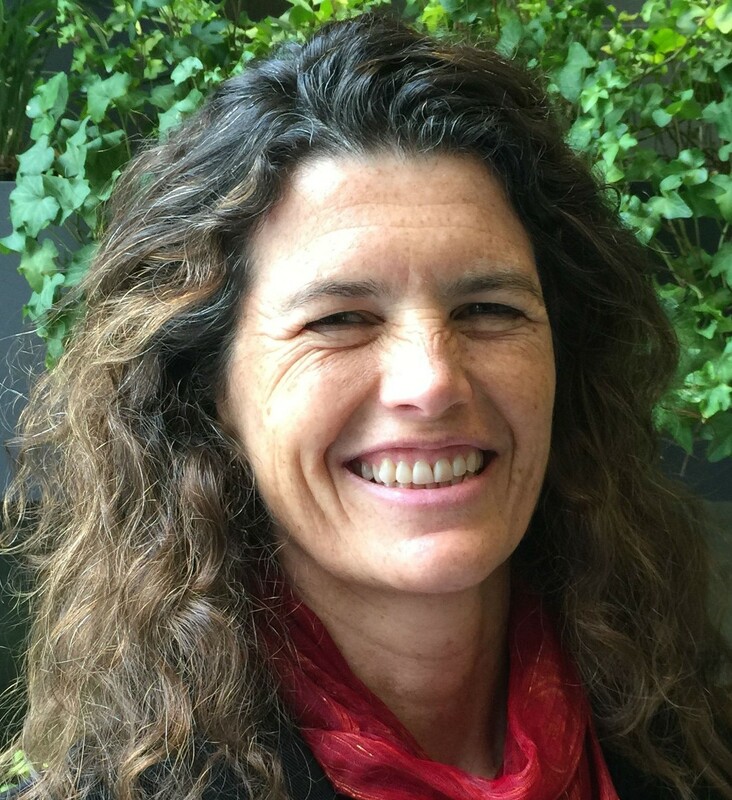 Jeni Miller is a Senior Research Associate at the Build Healthy Places Network.